For more than 35 years, Ocean Conservancy (OC) has been translating scientific understanding into sound, practical policies that protect oceans and improve lives — from rebuilding fisheries, to reducing impacts on marine wildlife, to restoring ocean ecosystems, and more. The BP Horizon oil spill of 2010 devastated not only the ecology of the Gulf of Mexico, but the lives of the people who live there. 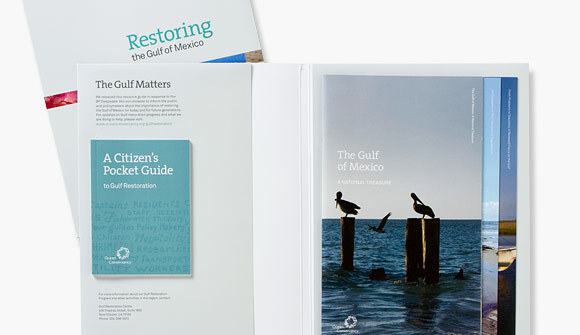 A key objective of the Ocean Conservancy’s response effort has been to guide and engage individuals throughout the process of restoring the ecology and economy of the Gulf region. Imaginary Office worked with the Ocean Conservancy to create an “On the Ground” toolkit that provides organized, knowledgeable and up-to-date information to those impacted by the oil spill. Whether recipients were seeking or offering help, or simply trying to stay informed, they could find critical information about resources available to them.